Proudly sponsored by Woolshed Brewery the Amazon Sprint is Round 4 of the Riverland Dinghy Club Championship Series held on Saturday 16th June. This race consists of time trials over three long laps and one short lap. Racers must complete a long lap first and then choose the order to race the remaining two long laps and one short Island lap. Strategy plays a huge role in the race. 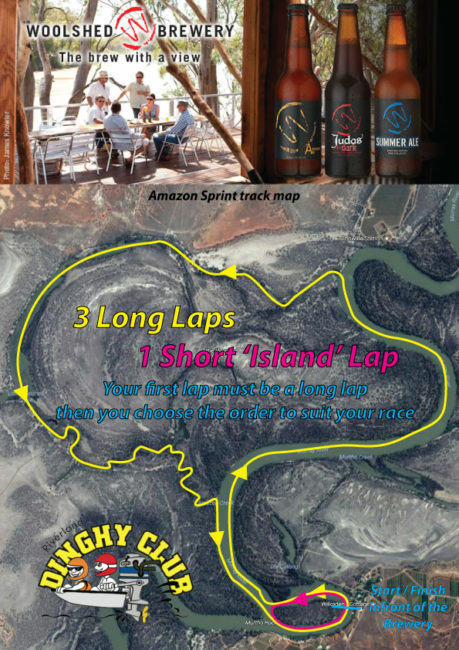 The Woolshed Brewery Amazon Sprint is conducted on the waterways in from of the brewery and upstream in the creek systems. Racing commences at 10 o’clock and finishes around 4 pm. The Brewery with a View is ideally suited to few the boats lapping the island and finishing the race. The race commences upstream and competition is hard and fast as the make their way round the first island lap. The Brewery has extensive undercover decking and seating areas inside and out, ample parking, catering will be available on the day and no entrance fee to view the race. Possible 2018 grid starts will be in the following format confirmed once entries close. 30hp Rookies R and 30hp Super Standards B.
RDC suggest that you make your way up river and settle down for the day allowing sufficient time to be in place, taking into account the closed water period and please observe the closed water restrictions when leaving your positions. Sufficient time has been allowed between the race and the presentation for everyone to be back in time.